Following exhibitions at the KIOSK in Ghent (2013) and the Kunsthalle in Basel (2015), this summer Vincent Meessen will be revealing the third version of Patterns for (Re)cognition at BOZAR. 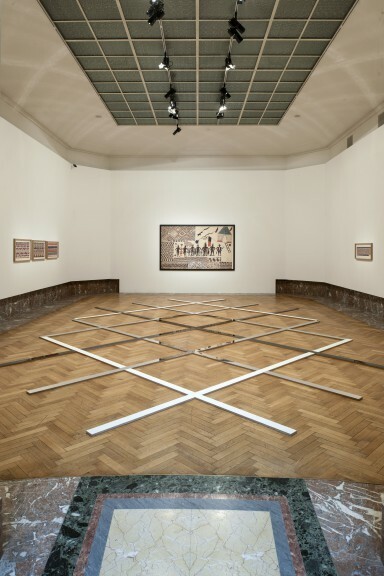 In this exhibition-in--exhibition, the artist looks at a gap in the modern art historiography of Belgium and the Congo. Acting as artist and curator he creates a unique context with modular structures, 16 millimetre films, 19th century objects and a sound installation. Together these serve to frame the abstract watercolours of Tshela tendu (Congo, circa 1880-1950) within the modernist heritage. Although this Congolese painter exhibited in Brussels, Paris, Rome and Geneva in the early 1930s, his work was subsequently and unjustifiably forgotten. Focusing on the abstract work of this Congolese pioneer, this exhibition contributes to the renewed interest Tshela tendu’s work enjoys progressively in Europe.